Illumination is an animation studio built on the backs of the tiny little creatures from its “Despicable Me” franchise known as the Minions. Therefore, it comes as no surprise that for only their fifth animated effort, they give these little guys their own spin-off film. Provided you enjoy their antics in the two “Despicable Me” films, you’ll have no problem deciding to spend your money and 91 minutes of your time in their company, and unfortunately that’s about as far as the studio was willing to stretch themselves this time around. If you’re not a fan of their schtick, steer clear of this film at all costs, but if you’re like me and you find their gibberish language and endlessly inventive sight gags amusing, this film is exactly what you were hoping it would be. Narrated – at least in the prologue and epilogue – by Geoffrey Rush, the opening credits of the film quickly speed through the Minions origin story, bringing them to the year 1968 within about seven minutes. This is both a good thing and a bad thing. It’s a good thing because it gets the film right into the thick of things, and helps it to breeze by. It’s a bad thing, however, because it more or less dispenses of any individual appeal the film may have had by essentially just making it another “Despicable Me” film without the villainous Gru involved. Having only just seen the film, I’m not entirely sure how I feel about this decision entirely, but I’m inclined to believe that while this decision was not the best possible option for their first solo effort, it’s a shrewd move from a marketing perspective. Giving people something they’re familiar with is Hollywood’s stock in trade these days, and if you go into this film hoping to see something new, innovative, or—god forbid—daring in this film, it’s only going to let you down. This is probably the entire franchise’s Achilles Heel at this point and all of the truly mischievous antics of the first film have evaporated. This is not to say that it’s not competently made or thoroughly entertaining, it’s just that the time-honored tradition of taking a great original idea and eventually making it look like everything else in the marketplace is not exclusively Dreamworks’ problem anymore. 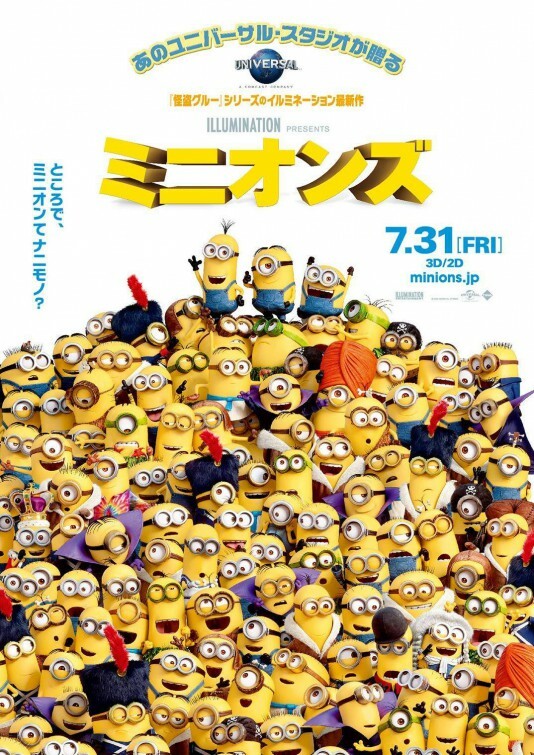 Yet somehow, “Minions” manages to be better than the average Dreamworks spin-off or sequel, whether it be the endless “Shrek” and “Madagascar” sequels or their lackluster spin-offs Puss in Boots “and “The Penguins of Madagascar“. This is largely due to the fact that the humor in these films is derived from a very universal and time-honored place where physical comedy reigns supreme. 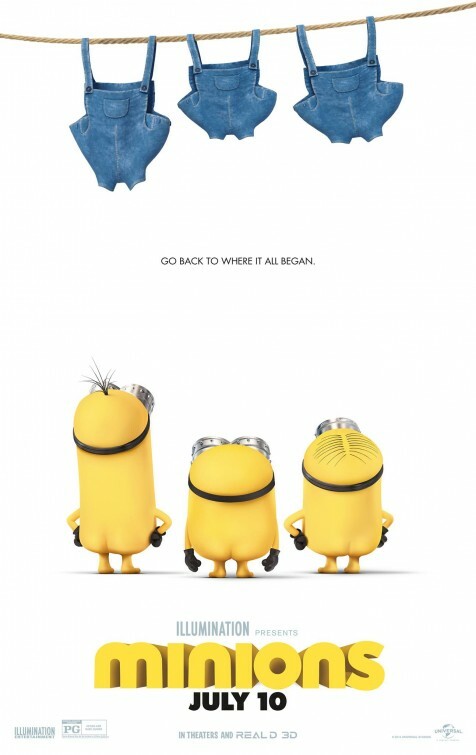 Dreamworks’ reliance on pop culture references and toilet humor has all but ensured they’ll never be able to compete with Pixar or LAIKA, but the best thing about the Minions is that they don’t have any of those pretenses. This isn’t lowest common denominator humor, but rather a well-oiled machine that, perhaps, realizes that they can’t churn out something that’s both hilarious and heartwarming, so they don’t really even bother trying. 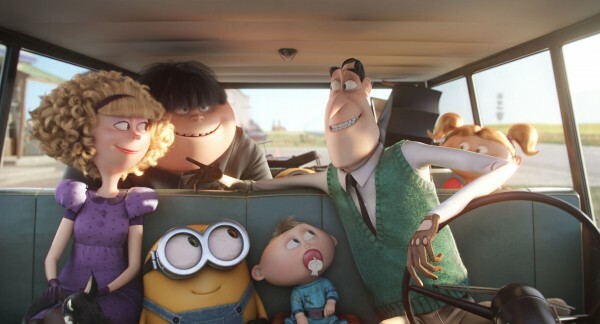 Illumination seems quite content to just give these little guys lots of fun situations and characters with whom they can interact, and then send people packing ninety minutes later with a smile on their face, rather than attempting to elicit a lump in their throat. This is not to say that these are films without ambition, just that they seem to understand that manipulating any emotions beyond laughter is best done elsewhere. Were you to dig into the story of “Minions”, you’d find nothing more than just another film about, as Charlie Kaufman via Nicolas Cage in “Adaptation” said, characters “learning profound life lessons or growing or coming to like each other or overcoming obstacles to succeed in the end.” The film earns none of its points on originality, yet the entertainment quotient is cranked so high that you only really notice when the film keeps dragging the audience back to its half-baked plot. Since the plot is so much of an afterthought, it’s hardly worth going into here, but it involves the Minions taking up with an evil villain named Scarlet Overkill (Sandra Bullock), whose dream is to become the Queen of England by stealing the Queen’s crown. The fact that it makes no sense isn’t a concern to anyone involved in the making of the film, so don’t concern yourself with the details. Bullock and Jon Hamm manage to wring some laughs out of their horribly clichéd characters, with Michael Keaton and Allison Janney as the head of a bank robbing family managing to more successfully get on the film’s fluffy wavelength. Pierre Coffin pulls double duty here, directing the film and voicing all of the Minions, and I’m more than willing to admit that his gibberish language makes me giggle. 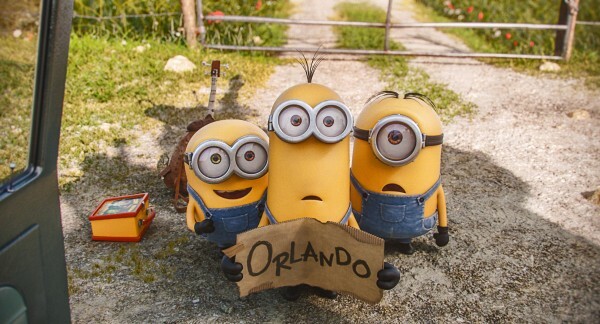 You likely already know whether or not you’re going to enjoy “Minions”, and if you’re a parent, you’re going to get dragged to it no matter how much you may protest. What you can be thankful for is that it’s a film without sweeping ambitions, that has a MacGuffin of a plot that is thoroughly disposable and completely contained within this single film. It’s best to just go with the film’s easy-going vibe rather than be a curmudgeon about the fact that the plot makes no sense and was likely the path of least resistance for these guys on their way to the big screen. Better to just chuckle along at the brilliant visual gags and enjoy the film for what it is. So few animated films know themselves as well as “Minions” does, and as a parent, I’m honestly thankful for that at this point. SIDE NOTE: Be sure to stay all the way through the credits for a hilariously genius cover of The Beatles’ “Revolution” featuring the entire cast. It’s quite nearly worth the price of admission by itself.